I love me some camp stove scrambled eggs, but it is not hard to step up the game a bit and make something fancier and more satisfying, even in the minimalist camp kitchen. 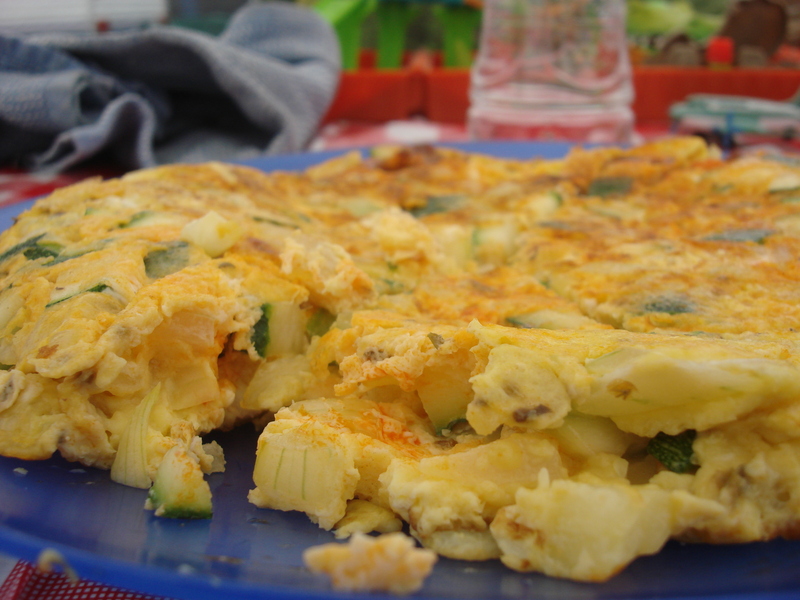 The following recipe makes for rocking outdoor breakfast/brunch eggs: a cross between an omelette and a tortilla. This is where you learn that it doesn’t have to have potatoes to be a tortilla…this one celebrates the zucchini season, but amps up the wow factor with a bit of spicy chorizo. It does justice to that big appetite that the outdoor life gives you, but cuts cooking and prep time in half. Set aside the lightly-beaten eggs in a large bowl. Heat half the olive oil until fragrant in an 8 or 9 inch skillet, then add onion and zucchini and sauté until tender. Remove from heat and stir vegetables into the egg mixture. Wipe skillet (leaving a bit of grease) and add chorizo, cooking at medium until it begins releasing its oil. Then add to egg mixture and allow to rest five minutes. In the meantime, wipe the skillet and add remaining oil. Heat the oil on medium high until fragrant and add egg mixture, seasoning with a bit of salt and pepper. Once the bottom of the egg mixture begins to set, shake pan to loosen and lower heat to medium. Cover and cook five minutes or until the whole egg mixture looks mostly set. Uncover and place a flat plate on top of the egg mixture and carefully turn skillet over so tortilla comes out. Slide tortilla back into the skillet and cook the other side till set. You may flip it several times until completely set. Flip finished tortilla out of pan and onto plate. Allow to cool somewhat before cutting into wedges and serving.